Click the image below tp subscribe to our free monthly newsletter - 24 pages of vintage beauties, builds, prints, plans, pin-ups, interviews, news and special deals. 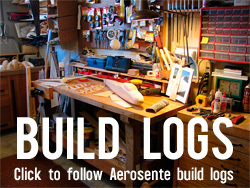 We have many build logs here on Aerosente. Several are always in process. Click the image below to see a list of our in process and completed build logs. Tony Condon is our Factory Rep for the Hall Cherokee II. He writes about all things Cherokee including photos, flight reports, a repository of known flying Cherokees, rebuilds, etc. Click below to read. Don't Miss The October 2012 Aerosente Newsletter - Pin-Ups Galore! One of the great designs that Frank Zaic came up with was his Sailwing, a 50 inch span freeflight towline glider circa the 1940's. If anyone knows the exact date or has built one and has photos and flight reports, I'd be very interested in having them posted here. Frank used a different approach to the stability problem than the Horten flying wings. Rather than the Horten's combination of airfoil change and aerodynamic twist in each of the wing panels, Zaic kept it simple by allowing the center sections of the wing to be built flat on the board while the outer tip sections had twist induces by locating the spars for these parts slightly lower at the leading edge. Along with the center and outboard vertical flying surfaces and the use of a launching stick with more vertical surface, the model was able to be towed to altitude and released for free flight. I can't wait to see how this model can be adapted to radio control and think it would make a really fun slope glider and may even have the potential to be enlarged and flown at over 100 inches. I for one think a low cost all wood flying wing at 2.5 to 3.0 meters would be a real kick on the slope! We are looking for beta builders for this kit right now so please contact us if you have experience with this kit, especially converted to RC. The new V2 Chuck Gulls are now shipping. Click below for more details. Click to visit the new Aerosente Youtube Channel. There are more than 40 videos there and more being added. Adrián Muiño Electrified Thermic 70 - It did it deliciously from the very beginning!!! 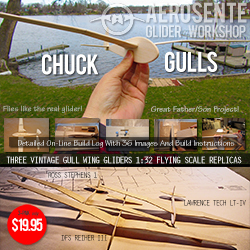 First Ever U.S. Vintage Gull Wing Sailplane Model Kit?